The oldest architectural culture in our territory dates back to 3500 BC. The first settlements – predecessors of present-day towns – emerged in the Bronze Age. Fortified settlements in Spišský Štvrtok and in Nitriansky Hrádok are the most famous of them. These large fortified settlements with urban characteristics – oppida – were already built by the Celts who came here around 400 BC. 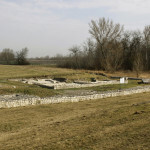 However, the most important monuments of ancient cultures in our territory are connected to the beginning of the 1st century AD, when the Roman border defence – limes romanus – was built along the river Danube. Remains of this border defence can be found in Rusovce (a borough in southern Bratislava), in Iža and within Devín Castle. Later, at the beginning of the 3rd century, further buildings emerged, built by the Romans in Germanic territory north of the river Danube. 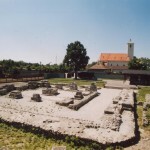 Let us mention at least two examples of these activities – the remains of the building complex in Stupava or the foundations of the Roman bath in Dúbravka (a city borough of Bratislava). However, none of the aforementioned Roman buildings are preserved in their original form. All of them fell as sacrifices to the turbulent period of the Great Migration and served as building materials for future builders. This fact represents symbolic continuity between Roman architecture and later constructions. 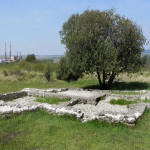 Regardless of this direct connection, the oldest preserved ancient Slavic monuments demonstrate that architecture in Slovakia – as well as the architecture of the whole Western world – was based on Classical architecture.